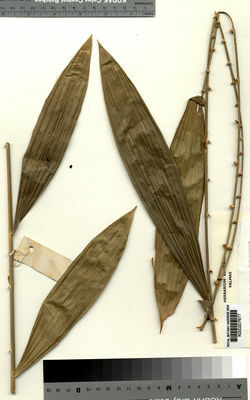 Known from two collections in Brunei. Elsewhere in Sarawak. 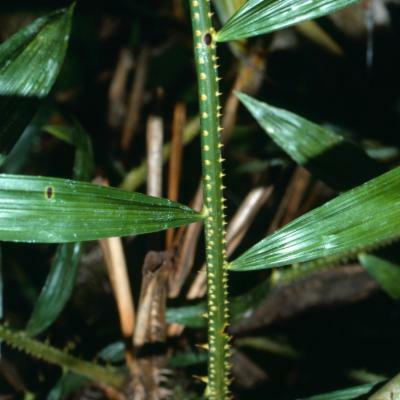 Endemic to Borneo. 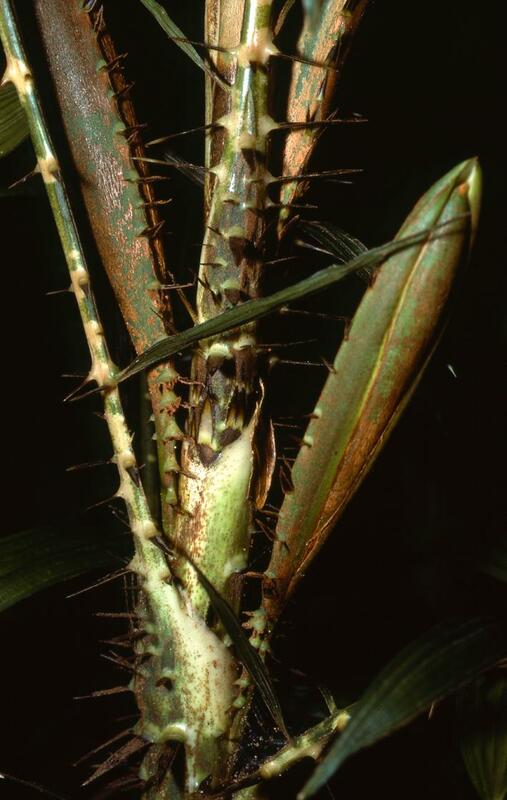 Slender to moderate solitary rattan with stems rarely longer than 5 m, usually only 2 m; stem without sheaths to c. 11 mm diam., with sheaths to 20 mm diam., internodes c. 8 cm long, sometimes much less. 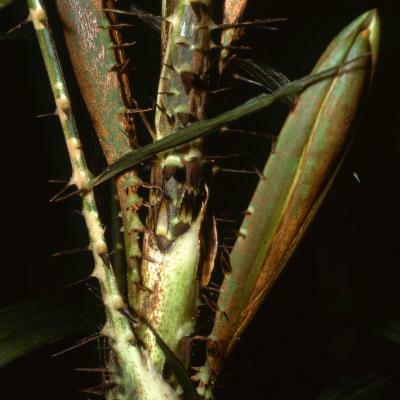 Sheaths bright green when fresh, bearing scattered, straight black spines to 15 mm with yellowish bases and abundant deciduous scales; knee conspicuous, the sheath pale creamcoloured above the knee; ocrea absent. 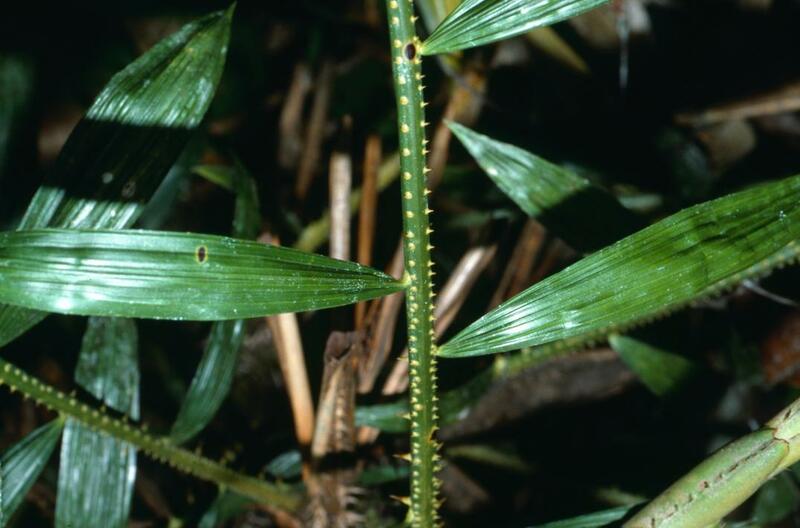 Rosette leaves ecirrate, to c. 1.5 m long, long-persisting, with 8-10 regularly arranged leaflets on each side of the rachis, petiole and rachis conspicuously yellow blotched. Leaves on climbing stems cirrate, to 2 m, but usually c. 75 cm, petiole very short, 2-5 cm only, cirrus to 75 cm; rachis sparsely armed, bright green, conspicuously blotched with yellow; leaflets 8-10 on each side, regularly arranged, broad, hooded and abruptly narrowed at the tip, very thick in texture, the largest to c. 25 × 6 cm, the basalmost 1-2 pairs very much smaller and narrower; transverse veinlets conspicuous. Inflorescences short, rarely more than 20 cm, rather congested; peduncle very spiny; prophyll c. 14 × 4 cm, ± woody; partial inflorescences c. 5; male rachilla c. 15 × 1.5 mm, female c. 25 × 3 mm, both densely covered in brown hairs. Mature fruit rounded, c. 20 × 16 mm, somewhat beaked, covered in 15 vertical rows of brown scales very heavily encrusted in dragon’s blood. Seed c. 14 × 10 mm; endosperm deeply ruminate. Seedling leaf not known. (Fig. 12, Pl. 4C). Not known with certainty but this must be one of the richest producers of dragon’s blood.